Scott S. is owner and operator of King Tide Audio, a music consulting company that has expertise across all areas of recording, including musical theory and arrangement, production, recording, editing and mixing. 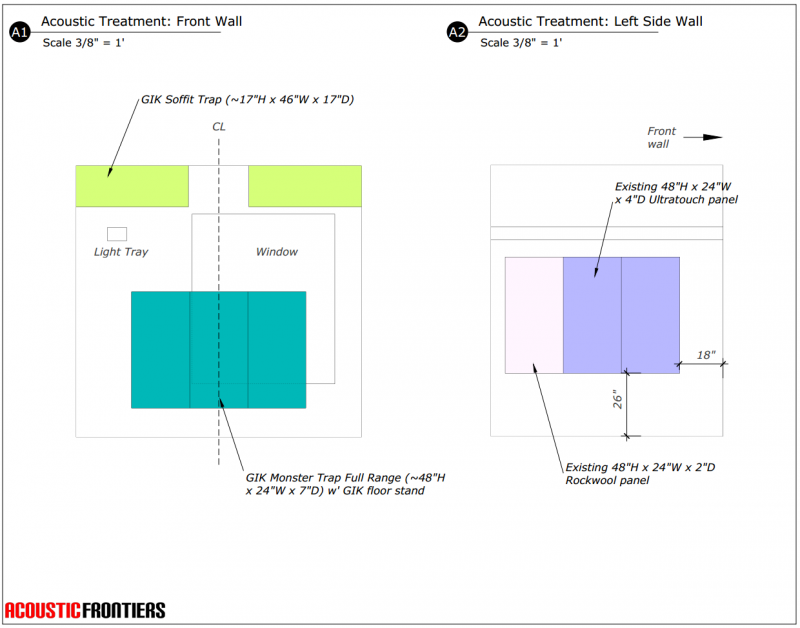 Scott approached Acoustic Frontiers to assist with improving the acoustics of his Marin home recording studio. He had experimented with some DIY acoustic panels, but was still struggling with mix translation due to bass issues. 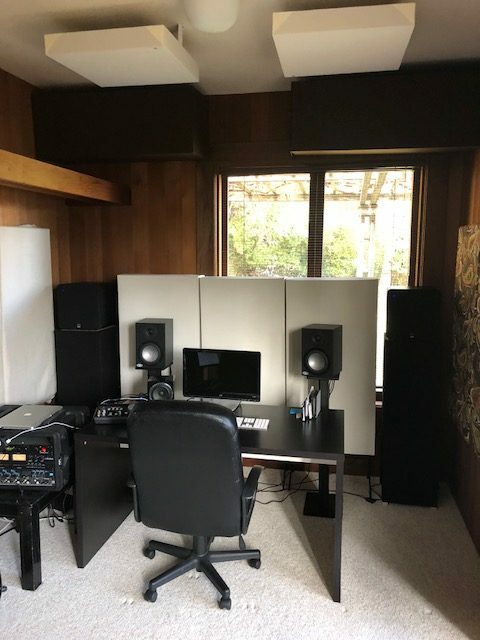 As this was a local Marin home recording studio project we made an on-site visit to take the acoustic measurements required for the Room Acoustic Analysis. We found huge peaks and dips in the response under 300Hz, as you can see below, with very significant resonances at 25Hz and 60Hz. 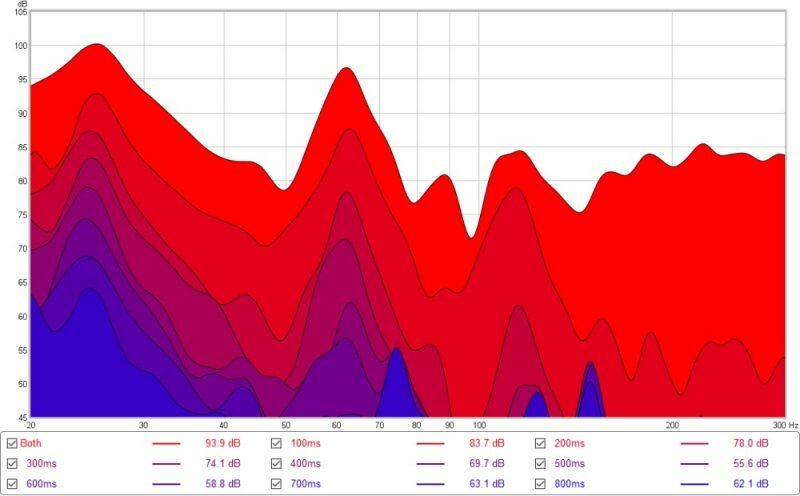 This chart shows how quickly bass decays in the room. You can see that the resonances at 25Hz and 60Hz decay more slowly than surrounding frequencies, which makes them very audible. At Acoustic Frontiers, issues in the sparsely populated room mode region under 100Hz are the most frequent acoustic problem that cause problems with the mixing process. If a mixer does not have an acoustically neutral (i.e. flat) room then there’s no way for them to know if an excess or deficiency of bass should be EQ’d or not. Of course, a mixer could use headphones, but most prefer listening through speakers. Below 100Hz speakers and room are inextricably linked in producing the “sound” that is heard. Notice that we put acoustic treatment last. Most people, when they try to fix bass issues, start with acoustic treatment, such as products marketed as “bass traps”. The reality is these products are typically very limited in their effectiveness below 100Hz. It’s not just clients who take this approach – many acoustics professionals will also not consider the design of the monitoring system itself as an avenue to pursue in the quest to achieve flat, non-resonant bass. We take a different approach. We believe a prime requirement for a mixing or monitoring system is flat response to at least 30Hz – i.e. “full range”. Our take is: if you can’t hear it , then how can you mix it? Typical two way studio monitors utilize a ported cabinet, and may only reach to 50 or 60Hz before their response falls off precipitously. Adding subs (yes, not just one) is therefore a no-brainer to get a full range system. You may think that adding subs will simply make things worse – more bass = more issues, right? Actually not! Because subs are physically separate from the left and right speakers, they can be placed in locations in the room where they minimally couple to any room mode resonances. They can also be deployed in “mode cancelling” arrangements. For more on our approach to managing low frequencies, please have a read of our free Bass Optimization eBook. In this particular space, our analysis showed that the 60Hz resonance was height related (the 1st axial height mode), and so we recommended that two subs be placed at 50% of room height. This arrangement would minimally couple to the height mode and still provide natural cancellation of the 1st axial width (as the left / right speakers did already). We knew, however, that adding subs in the recommended location would make the 25Hz issue worse (there was unfortunately no way to locate the subs in a better position in this room due to practical limitations). We also recommended a significant “beefing up” of the acoustic treatment to add more damping in the sub-300Hz region, and adding reflection control to the ceiling. Due to budget constraints, we recommended low cost, medium performance GIK products together with some DIY dual purpose subwoofer stands / acoustic absorbers as well as re-use of the client’s existing DIY absorber panels. After Scott added the acoustic treatment and subs to his Marin home recording studio, we made a visit to integrate and calibrate them. We used a miniDSP 2×4 for bass management and equalization. 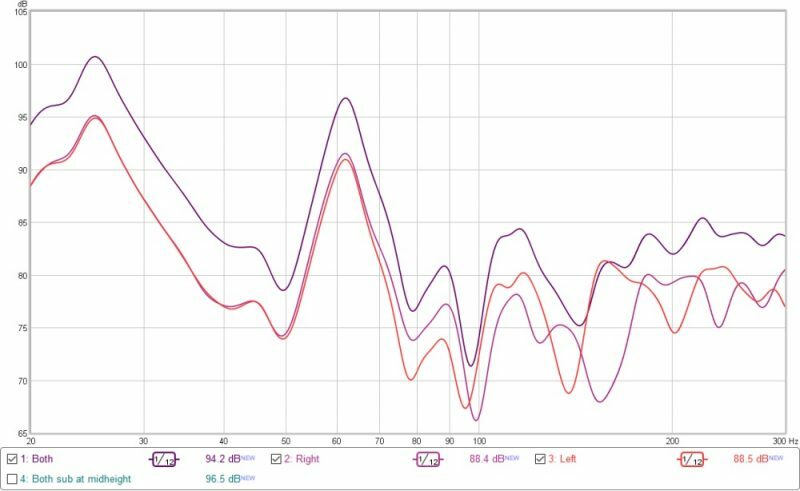 You can see that even without EQ, the response with subwoofers and bass management is significantly flatter compared to the response shown at the beginning of this case study, save for the 25Hz issue which we already knew in advance would be worse. After EQ, the system is pretty flat, considering the limited budget available! Mixing room post-acoustic treatment – notice the two subwoofers mounted on DIY stands at 50% of room height. “As a mixing engineer and bass player, I could hear that my Marin home recording studio was lacking something in the lower register. I knew that I needed professional help designing a studio with acoustics that I could trust and enjoy. 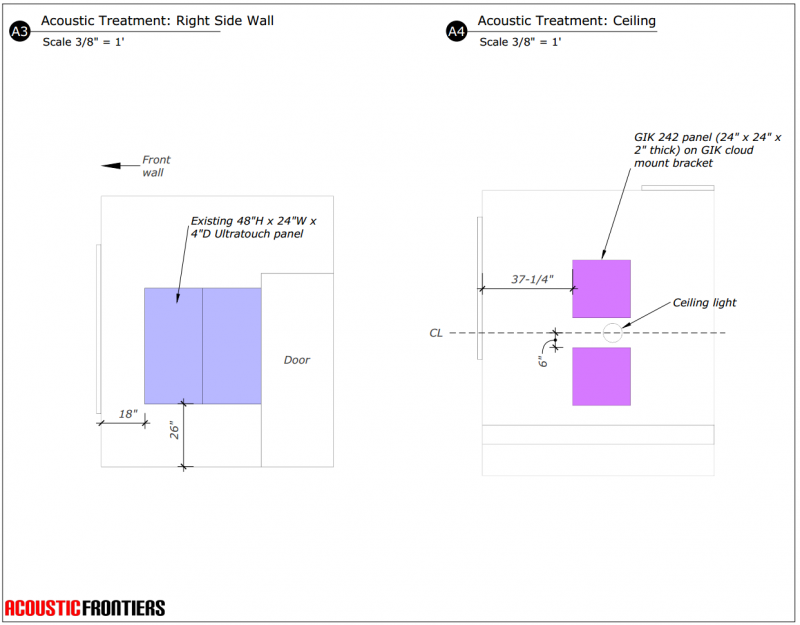 Acoustic Frontiers took my needs and limitations into consideration as they analyzed the acoustics, designed improving elements, and calibrated the equipment. I’m quite satisfied with the results. And I learned a few things along the way!” Scott S., Marin, CA. you offer great content on your website – thanks for providing such useful information! One question concerning your measurements and the placement of the subs: Do these multiple sub techniques improve the quality of bass reproduction in one specific spot of the room (the listening position) or is the listening experience considerably improved in the whole room? If you concentrate on one spot in the room (and I guess you do so): How small is the flat sounding area after sub and dsp based eq treatment. This is relevant for me, because I tend to use a bit of outboard equipment and therefore have to move my head quite a bit. Your working area, where the bass response is consistent, will depend on your room size. In a very small room the nature of room mode resonances means you have a lot of frequency response variability in a small distance. In a larger room nodes and anti-nodes (areas of highest and lowest pressure) for a given room mode are further apart in distance. Generally the rooms we help with only have budget for two or four subs, so the working area will be limited to specific areas in the room. The more subs, the bigger this area can be as you can manage the room modes by using active room mode cancellation techniques. If you have a big budget, then you can do a dual bass array, and get very consistent bass across the whole room from front-to-back, side-to-side and top-to-bottom. The expected response at different locations in the room can be predicted using computer modeling. We use advanced boundary element modeling (BEM) techniques and can predicted any number of subs, signal processing, locations and non-rectangular spaces. But BEM is not something you would do as a DIYer – these are professional level tools. However, if your room is rectangular, you can get a decent feeling for the response at different locations for up to four subs check out the room simulation tool in Room EQ Wizard.